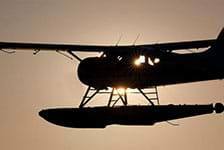 Book a seaplane tour of San Francisco with Seaplane Adventures. Departing from nearby Sausalito, Seaplane Adventures offers excited air tours of San Francisco and the California coast. Soar above famous landmarks like Angel Island, the Golden Gate Bridge, Alcatraz, and Muir Woods. Nothing can quite compare to seeing the California coastline by a seaplane. Book with Seaplane Adventures for an unforgettable San Francisco experience.